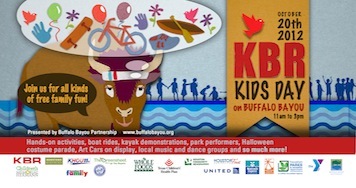 Join Young Audiences at the 6th Annual KBR Kids' Day on Buffalo Bayou. Free family friendly activitie include hands-on games and art-making, kayak demos, park performers, skateboarding demonstrations and much more! The Young Audiences of Houston activity station will feature, Danny Russo leading a silk-screening demonstration and activity for families.